Most of us have probably misplaced our Androids at least once in our mobile lifetime. That is annoying and frustraing. 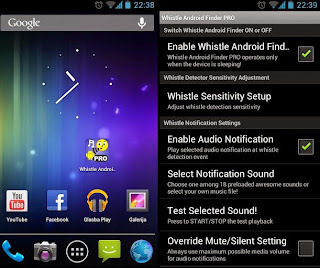 Whistle Android Finder PRO 5.4 (full paid) will help you locate your phone or tablet just by whistling at it. The app may have some bugs but that's what updates are for! In contrast to the free, ad-supported version, the paid Whistle Android Finder PRO does not include any ads! Furthermore, the set of requested permissions is much lower now. Only the essential permissions are requested. Much lower battery consumption due to optimized whistle detection engine when compared to the Whistle Android Finder FREE. The application has been designed and strongly optimised in order to reduce battery drain as much as possible. 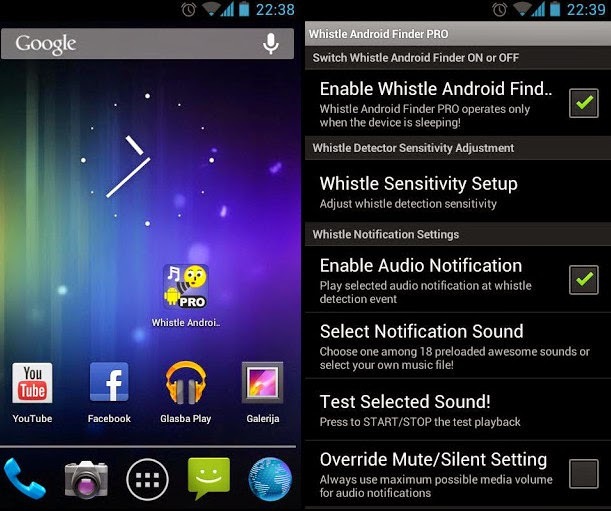 Customized whistle notification sounds are supported in PRO version. Simply select any MP3 or M4A music and apply it as notification! 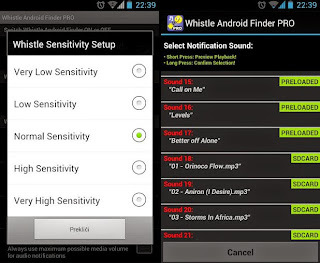 Under the Whistle Android Finder PRO settings tab it is also possible to choose among 20 different very amusing preloaded audio notification sounds to notify the presence of the detected whistle! Whistle Android Finder PRO can be enabled or disabled under the settings tab. Just run the application and the settings tab will appear! Remember: Whistle detection is working ONLY when the device is sleeping (i.e. when the screen is OFF). Once enabled, Whistle Android Finder PRO will work even if you reboot your Android device! Of course, you can disable it under the settings tab at any time. Integrated brand new Battery Guard feature to save your battery!